1558-1603. 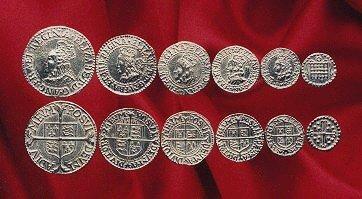 Left to right: Shilling, Sixpence, Groat, Halfgroat, Penny, Halfpenny. On the reverse "Posui Deum Adivtorum Meum" translates to "I have made the Lord my helper".